All states and local electrical Authorities Having Jurisdiction (AHJ) that have adopted the National Electrical Code® (NE C®)1 require industrial control panels to be marked with a Short Circuit Current Rating (SCCR). The Short Circuit Current Rating is the maximum current the control panel can safely withstand without excessive damage. If the available fault current of the electrical system where the panel is installed exceeds the SCCR of the panel and a short circuit occurs, catastrophic damage to the panel may occur and electrical workers and others are put at risk of injury. It is the responsibility of the consulting or electrical design engineer to verify that all industrial control panels are applied in a manner such that the panel’s SCCR is greater than the system’s available fault current. It is the responsibility of the industrial control panel manufacturer to provide accurate SCCR information to the consulting engineer and Authority Having Jurisdiction through required labels and published technical information. The importance of effective motor and motor circuit protection cannot be over emphasized. Motors are consistently the largest single cause of industrial and commercial fires, and in today’s highly automated commercial and industrial facilities, the failure of even one relatively minor motor may shut down an entire installation. As a result, it is vitally important that there is at least a basic understanding of how motors and their related electrical systems can be properly protected. 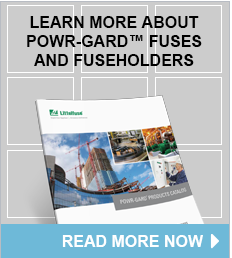 The purpose of this White Paper is to provide a more detailed discussion of the factors which must be considered when properly selecting and applying low voltage fuses, medium voltage fuses, and protection relays in electrical systems. The importance of effective transformer and control transformer protection cannot be over emphasized. After motors, transformers are typically the second most common application where proper overcurrent protection is required and utilized to provide the necessary protection to facilities, electrical systems, equipment, and most importantly electrical workers and other involved personnel. As a result, it is vitally important that there is at least a basic understanding of how transformers and their related electrical systems can be properly protected. The purpose of this white paper is to provide a more detailed discussion of the factors which must be considered when properly selecting and applying low voltage fuses and medium voltage fuses in electrical systems. Grid-connected commercial photovoltaic (PV) systems are trending towards larger sizes, resulting in systems with higher bus voltage and current levels. Problems caused by ground faults are becoming a bigger concern due to increased energy available at the point of fault; arc-flash and shock hazards, equipment damage, and fires can result. Medium voltage fuses are applied quite differently than fuses rated 600 volts and less. The biggest difference is that medium voltage fuses are not intended to provide overload protection. They should only be applied in situations where it will not be required to open small overcurrents. Medium voltage fuses offer a much wider range of system voltages, thereby resulting in a correspondingly large number of fuse voltage ratings. This white paper contains details of factors which must be considered when properly selecting and applying medium voltage fuses in electrical systems. There are some common misconceptions about Arc-Flash Hazard Assessments which reduce the effectiveness of the Assessments and can increase electrical hazards. These misconceptions exist because of the confusion about the laws and standards that apply regarding Arc-Flash Hazard Assessments. It is important to note that the Occupational Safety and Health Administration (OSHA) may rely on numerous consensus standards to enforce their regulations, and this may vary by state. Further confusion is caused by the various methods used to calculate and quantify Arc-Flash hazards. When deciding to do an Arc-Flash assessment, it is vital to determine what is being offered by a service company and what is required by OSHA or local authority having jurisdiction (AHJ). The goal of this paper is to discuss some of the common misconceptions regarding Arc-Flash Hazard Assessments and clarify what OSHA and the National Fire Protection Association® (NFPA®), actually require. Littelfuse reminds electricians and managers of industrial facilities and large commercial buildings of the hazards associated with working around electrical equipment that has been exposed to flood water, and provides instructions for a safe restoration. Flood waters are generally contaminated, and leave conductive and/or corrosive residues inside equipment that can produce shock and fire hazards. Affected equipment should be replaced or refurbished to avoid risk of fire and shock.